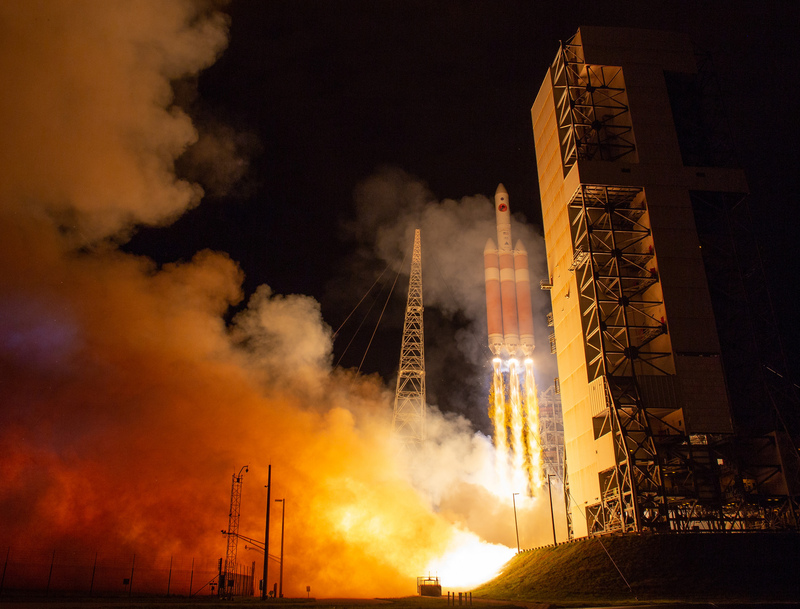 Just two days after launch on Aug. 11, 2018, from Cape Canaveral Air Force Station in Florida, NASA’s Parker Solar Probe achieved several planned milestones toward full commissioning and operations, announced mission controllers at the Johns Hopkins Applied Physics Laboratory, or APL, in Laurel, Maryland. On Aug. 13, the high-gain antenna, which Parker Solar Probe uses to communicate high-rate science data to Earth, was released from locks which held it stable during launch. Controllers have also been monitoring the spacecraft as it autonomously uses its thrusters to remove (or “dump”) momentum, which is part of the flight operations of the spacecraft. Managing momentum helps the spacecraft remain in a stable and optimal flight profile. The United Launch Alliance Delta IV Heavy rocket launches NASA’s Parker Solar Probe on its voyage to the Sun, Aug. 12, 2018, from Launch Complex 37 at Cape Canaveral Air Force Station, Florida. Parker Solar Probe is humanity’s first-ever mission into the Sun’s atmosphere, called the corona. Here it will directly explore solar processes that are key to understanding and forecasting space weather events that can impact life on Earth. 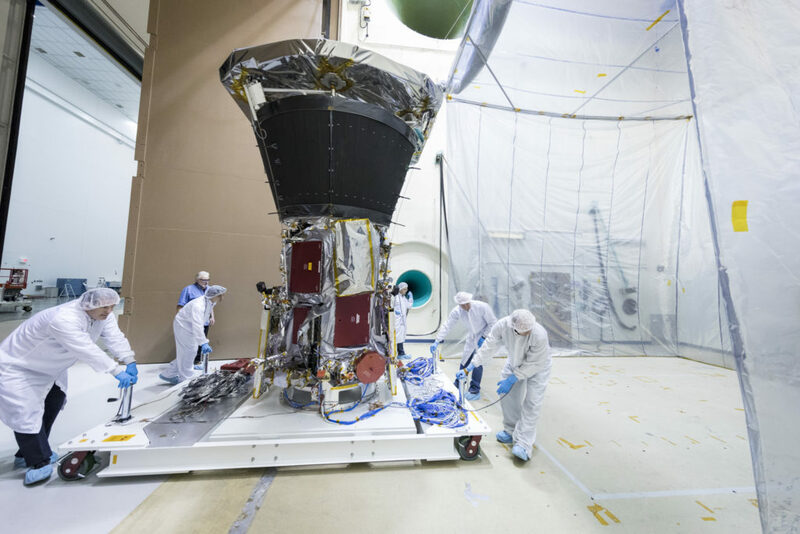 There are four instrument suites on board Parker Solar Probe, which will each need to be powered and readied for science data collection. The FIELDS investigation, which consists of the most elements, went first. It was powered up on Aug. 13 for two activities. First was the opening of the clamps which held four of the five FIELDS antennas stowed during takeoff. These antennas will be deployed roughly 30 days after launch, and they will stick out from the corners of the spacecraft’s heat shield — called the Thermal Protection System — and be exposed to the harsh solar environment. Second, the spacecraft’s magnetometer boom was fully deployed. This boom contains three magnetometers and a fifth, smaller electric field antenna, all part of the FIELDS suite. Further instrument check-outs and deployments are scheduled in the coming days for the spacecraft. As of 12:00 p.m. EDT on Aug. 16, Parker Solar Probe was 2.9 million miles from Earth, traveling at 39,000 miles per hour, and heading toward its first Venus flyby scheduled for Oct. 3, 2018, at 4:44 a.m. EDT. The spacecraft will use Venus to slightly slow itself and adjust its trajectory for an optimal path toward first perihelion of the Sun on Nov. 5, 2018, at 10:27 p.m. EST (Nov. 6, 2018, at 03:27 UTC). When NASA’s Parker Solar Probe lifts off on top of a Delta IV Heavy launch vehicle in summer 2018, it will undergo both intense vibration from the physical forces of the rocket engines, as well as acoustic effects from the sound of the engines and the rocket going through the atmosphere. Verifying the spacecraft and its systems are ready for the rigors of launch is one of the most important parts of testing. 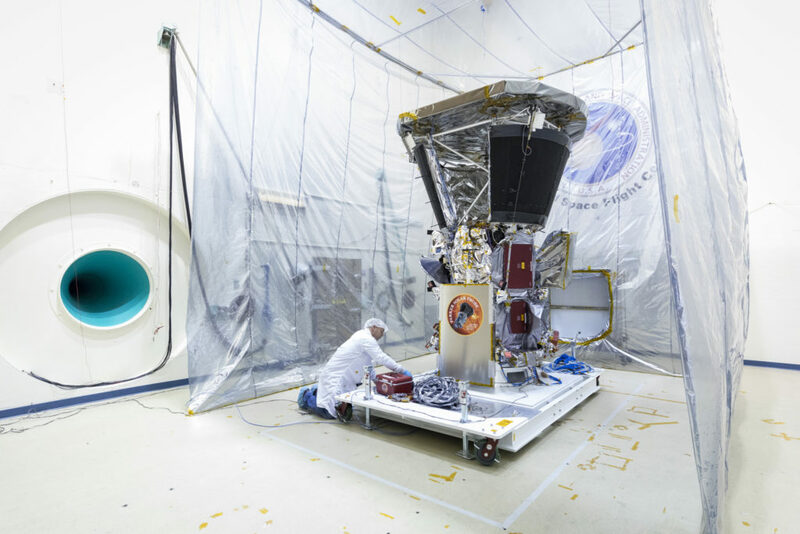 On Nov. 3, Parker Solar Probe passed vibration testing at the Johns Hopkins Applied Physics Laboratory, or APL, in Laurel, Maryland, where it was designed and built. 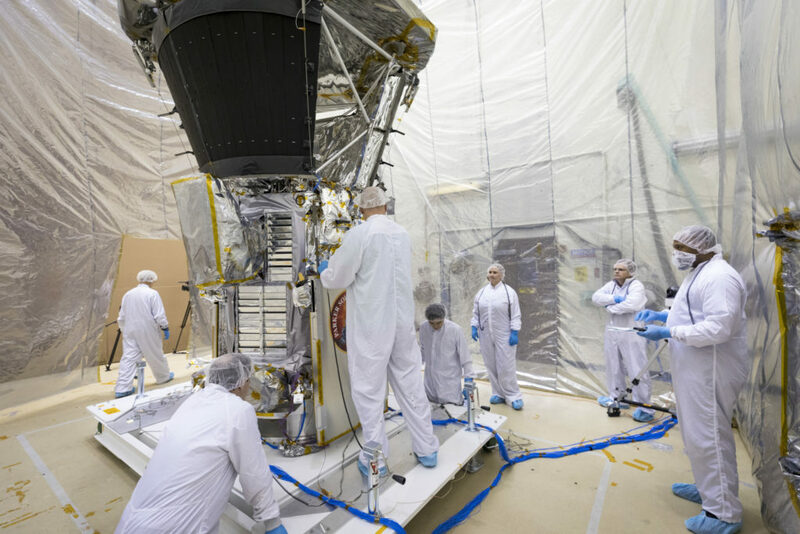 On Nov. 14, the spacecraft successfully completed acoustic testing at NASA’s Goddard Space Flight Center in Greenbelt, Maryland, and is now being prepared for further environmental tests. Goddard’s Acoustic Test Chamber is a 42-foot-tall chamber that uses 6-foot-tall speakers –which can create sound levels of up to 150 decibels – to simulate the extreme noise levels of a rocket launch. While vibration testing focuses on how much the spacecraft will shake during launch, acoustic testing subjects the probe to intense sound forces, like those generated by the Delta IV Heavy. Each type of force affects the spacecraft differently, so both tests are necessary. 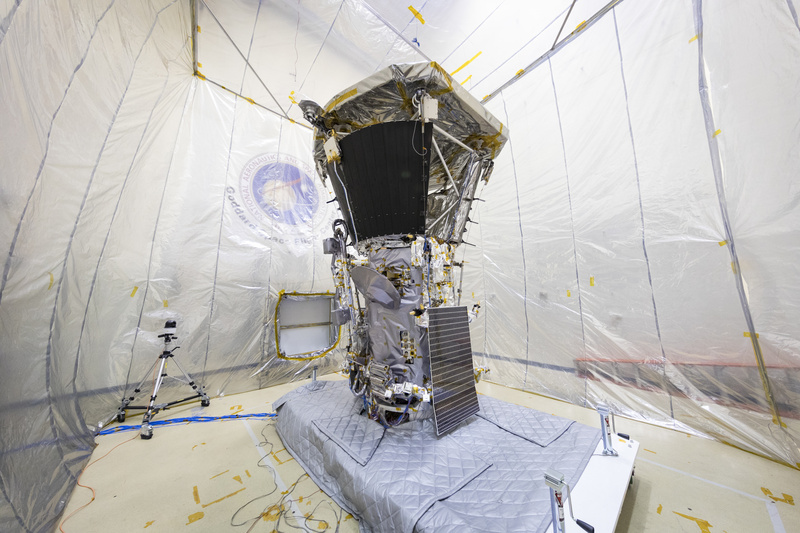 Parker Solar Probe spacecraft will explore the Sun’s outer atmosphere and make critical observations that will answer decades-old questions about the physics of stars. The resulting data will also help improve how we forecast major eruptions on the Sun and subsequent space weather events that can impact life on Earth, as well as satellites and astronauts in space. The mission is named for Eugene N. Parker, whose profound insights into solar physics and processes have helped shape the field of heliophysics. 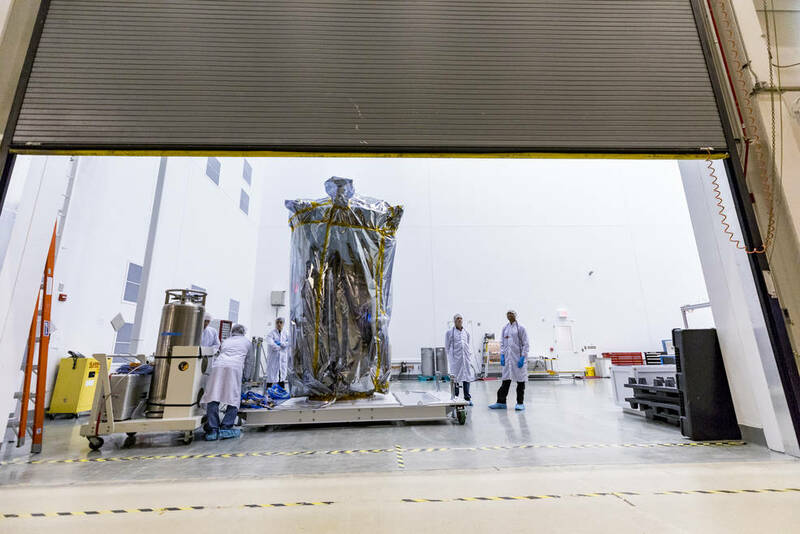 On Monday, Nov. 6, 2017, NASA’s Parker Solar Probe spacecraft arrived at NASA’s Goddard Space Flight Center in Greenbelt, Maryland, for environmental tests.